Ahead of Saturday’s presidential election, South West Muslim leaders and those in Edo and Delta states, last Sunday, declared their support for President Muhammadu Buhari’s second term bid. This was even as Dr. Yusuf Adebayo Ibrahim, a commissioner in charge of Policy, Personnel Management and Finance (PPMF) at the National Hajj Commission (NAHCON), who is the link man, urged Nigerians, especially Yoruba, to vote wisely by re-electing Buhari; just as he noted that to do otherwise would be tantamount to squandering their children’s future. 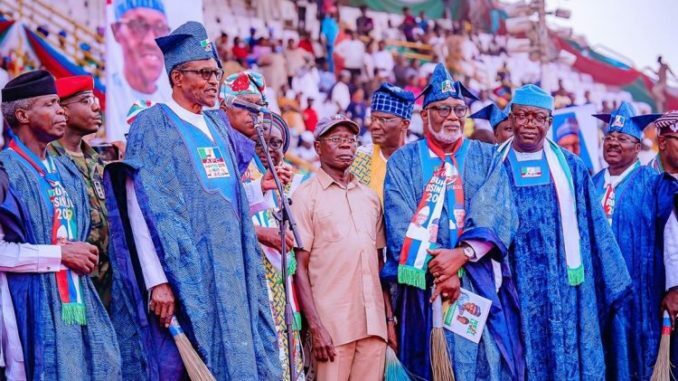 He spoke on the sidelines of the All Progressives Congress (APC) Presidential Campaign Council Town Hall Meeting with South West Ulamas and those of Edo and Delta, held in Ibadan, capital of Oyo State. Present at the meeting were the Chief Imam of Ibadanland, Sheikh Abdulganiy Agbotomokekere; Aare Musulumi of Yorubaland, Edo and Delta, Alhaji Dauda Makanjuola; Chief Imam of Oyo town; Head of Department, Arabic Studies, University of Ibadan, Prof. Kamil Oloso; and Chairman, Muslim Community of Oyo State, Alhaji Kunle Sanni, among others. The religious leaders noted that their support for president Buhari was informed by his performance, which they noted was aimed at putting Nigeria on the path of growth and development. Welcoming the religious leaders earlier, Dr. Ibrahim noted that the Town Hall meeting was aimed at sensitising the Muslim community through the clerics of the various reforms carried out by the Buhari’s administration since 2015 and why he should be supported to return for another term. “As Muslims in the South West and who are serving in this administration, we have a duty to tell you the truth about the happenings in our country. As a government, the Buhari administration may not have done everything we expected it to do, but, what the administration has achieved in four years is unprecedented in the history of the country’s return to democracy in 1999.